I’ve run across some fascinating statistics which, taken together, indicate that the average American earns little more than he did in the late 1980’s. Does this mean the American economy is experiencing a lost quarter century? Let’s take a look. Productivity–wages have been stagnant, but increases in productivity via technological improvements are still increasing consumer purchasing power, allowing consumers to buy more with an equivalent income. 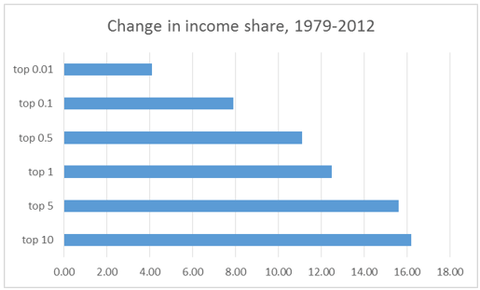 Biggest Gains at the Very Top–5% is not a high enough threshold. The most significant economic gains have not gone to the top 5%, or even the top 1%, but to the top 0.1% and the top 0.01%. What we see here is that it is not merely the rich who benefit, but the richest of the rich. The top 5% have almost all of the gains of the top 10%, the top 1% have almost all of the gains of the top 5%, and so on. The top 0.1% have enjoyed half of the gains made by the top 10%. This means that even most affluent people are being screwed over by still more affluent people. The top 0.1% has a household income of $1.6 million annually, and even in their case, around half of their gains go to the richest 1/10th of them, the top 0.01%. It was difficult to find the precise figure for the minimum amount of income the top 0.01% possess, but I managed to find it–$9.1 million. Given that, by definition, almost no one in the United States has an income of this kind, the vast majority of affluent people in the United States who believe themselves to be relative beneficiaries of the policies of the past 30-40 years are themselves victims of those still higher up the chain. The big fish eat the little fish, the bigger fish eat the big fish, and the biggest fish eat the bigger fish, yet all eating fish endorse the system, even though most eating fish are themselves eaten. 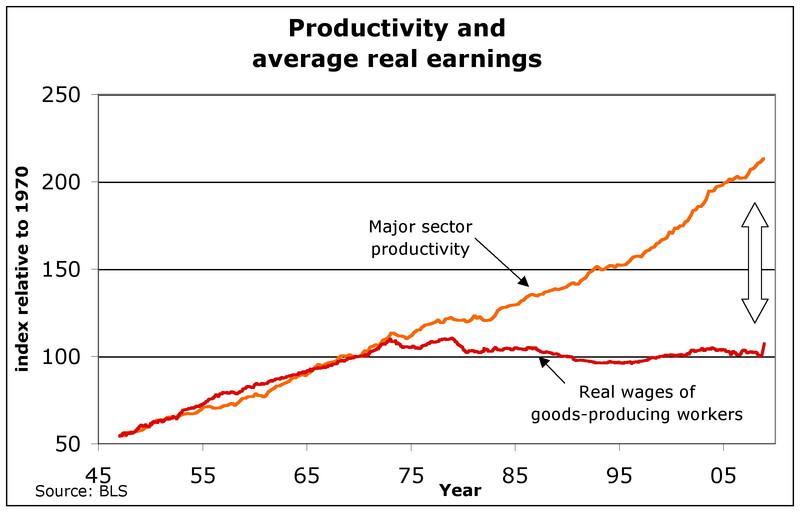 In the long-run, we need to re-link wage growth to productivity growth if we are to regain the economic vitality we experienced in the 50’s and 60’s. Every single person likely to be reading this blog would benefit from policies that move us in this direction. Those who oppose these policies who are not multi-millionaires are foolishly acting against their own long-term interests. The Half a Trillion Dollar Question: Where have the missing wages ended up? If their are indeed missing wages, then that money should still be somewhere to be found on the national accounting books—otherwise, that money is not part of the real economy and we cannot “close the gap” in a sustainable way. This is even true of stimulus, where the money is trapped on bank balance sheets in the form of liquid savings until the government irrationally demands it. The answer is in the Current Account, as a deficit. Our debts have necessitated debits to the Current Account primarily in the forms of unbalanced imports, thus counting against Gross Domestic Production. In order to close the wage gap, we have to solve the deeper problem of our debt and budget imbalance. No easy task. It’s in both the current account and in the investment portfolios of the very wealthy (much borrowing remains domestic borrowing, not foreign borrowing, and so does not factor into the current account). While you argue that debt and deficits necessitate imports, I would argue for reverse causation–as globalization permitted us to outsource to cheaper, non-unionized labor, imports rose, encouraging borrowing. This has produced a downward pressure on wages, as American workers attempt to compete with their Chinese counterparts. Due to downward nominal wage rigidity, the result is wages that increase, but no faster than the rate of inflation. Of course, but so long as debt can be sold to foreign owners, we can’t simply buy back only foreign debt to effect the current account. Sure, it’s a bit imprecise to say that we have to buy back all debt to zero out the current account, but allowing the free flow of debt means in practice, that’s what we’d have to do. All domestic debt can become foreign debt and vice versa. The problem with this is that there must be a countervailing debit in the Financial or Current Account and you fail to provide one. This to me explains why the deleterious effects of our debt have shown up where they have—and is in fact a more formal statement of the argument I make in the linked post. While it is likely many of these effects would be challenges without deep foreign debt, it is hard to argue that we’ve not further subsidized Chinese exporting at our worker’s expense. It might well be the case that the debit is primarily accounted for by the moving of private money. Household debt, not government debt, may be the driver here. Actually, looking at the data, I’m less and less convinced this is linked all that strongly to the current account–productivity and wages become de-linked in the 70’s, but the US does not begin to run a major current account deficit (or budget deficit) until well into the 80’s. A brief return to a positive current account in the early 90’s is accompanied by falling, not rising, household incomes, and the Clinton surplus comes in the face of an increasing current account deficit. Indeed, wages seem stagnant pretty much irrespective of the size of the current account or the budget deficit over the post-1975 period. I would even perhaps venture to say that rising household incomes are likely the result of increased hours worked and increased participation in the workforce by spouses, as wages do not seem to rise even when incomes do. This would suggest that the primary location of the missing wages is the financial system and the domestic rich, not the current account. This is why you can’t just eyeball two aggregate accounts. I’m most familiar with the 90s case, where foreign debt actually shifted to the United States; we came to own more of other nations private and public debt in the wake of the Asian crash. Indeed, federal debt held about steady over that time while wages fell in the aftermath of the demand collapse. There is so much noise in that part of the series I am unsurprised that inspection (which is not valid statistical analysis) yields no obvious correlation. This is a noisy series in general, and the correlation shouldn’t be terribly evident to the naked eye. However, this isn’t something that is really up for statistical debate. This is what is legally required of accountants. When trade happens, they must record these relationships in these ways. Are you suggesting there is a massive failure of the accounting establish to properly record where money has ended up? I’m suggesting that the current account deficit is not large enough to account for the absence of wage gains, and that private sector debt may be compensating for negative balances of trade far in excess of public debt. While inspection cannot conclusively prove this, I also see no reason to believe that this is not the case. Why presume that most if not all of the lost wage gains are in the current account, and further, why presume that this is driven by public debt rather than private debt, which has grown much faster and more consistently over the relevant period? I’m not being as clear as I could be. It’s not a simple matter of the aggregate Current Account at any one point, but rather a function of our long-term debt. Remember, small, sustained changes in growth rates have far-reaching impacts. 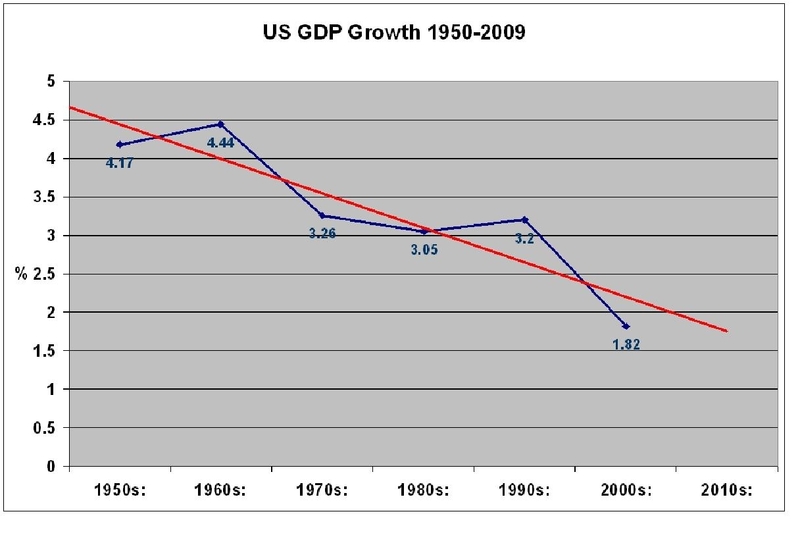 A growth rate of 1% of GDP doubles the economy in 70 years. 2% in 35; 3% in 23. The present Current Account deficit is a lost doubling power of 19 years. Temporary policies are small, not hard to offset by multiplier effects. But 20+ years running they are monstrously inefficient. There are other explanations for why in any given period this effect was more or less visible. 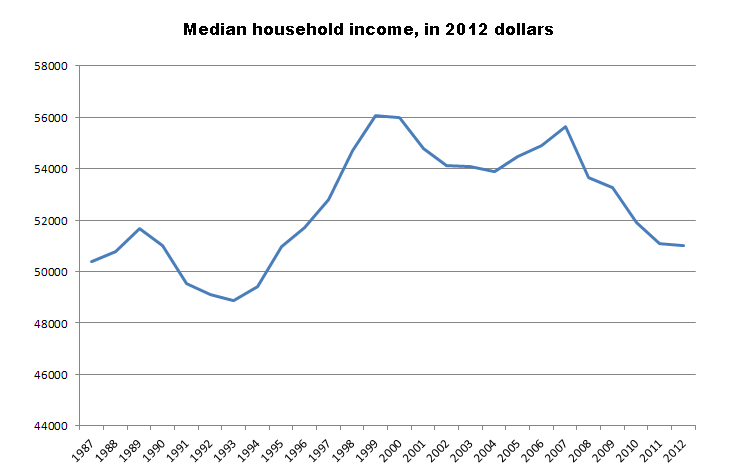 The present trough in median income is an effect of the, well, present trough. The 90s imbalances have to do with the financial crash in East Asia; our deficit reversed by our debt did not. And those bear looking at. However, we’re short 5.8 Trillion dollars and counting in GDP the federal government /explicitly/ sent abroad. This doesn’t account for the lost growth, just the GDP we’ve explicitly debited. Ben, that’s at least a GDP of 18.8T sans growth effects—more than enough to close the worker gap. My point being, no I would not expect this to show up in a naked eye examination of the data. Yes, it is that big. If that’s true, wouldn’t that imply that we would have a stronger economy if we’d made a concerted effort to reduce exports? That is to say, doesn’t this imply protectionism? It may well be that that’s the case, but I don’t typically see economists supporting protectionist policies. Surely the current account deficit could be shrunk from the trade end rather than from the debt end? And it’s still not clear to me why you point the finger at government debt in particular as opposed to all domestic debtors to foreign third parties. Seems like a globalization problem, not a budgeting problem.